British statesman, born in London on the 11th of April 1770. The family was of English origin and had been settled at Bishop's Canynge in Wiltshire. In 1618 a George Canning, son of Richard Canning of Foxcote in Warwickshire, received a grant of the manor of Garvagh in Londonderry, Ireland, from King James I. The father of the statesman, also named George, was the eldest son of Stratford Canning, of Garvagh. He quarrelled with and was disowned by his family. He came to London and led a struggling life, partly in trade and partly in literature. In May 1768 he married Mary Annie Costello. and he died on the 11th of April 1771, exactly one year after the birth of his son. Mrs. Canning, who was left destitute, received no help from her husband's family, and went on the stage, where she was not successful. She married a dissolute and brutal actor of the name of Reddish. Her son owed his escape from the miseries of her household to another member of the company, Moody, who wrote to Stratford Canning, a merchant in London and younger brother of the elder George Canning. Moody represented to Stratford that the boy, although full of promise, was on the high road to the gallows under the evil influence of Reddish. Stratford exerted himself on behalf of his nephew. An estate of the value of £200 a year was settled on the boy, and he was sent in succession to a private school at Hyde Abbey near Winchester, to Eton in 1781, and to Christchurch, Oxford, in 1787. After leaving Eton and before going to Oxford, he was entered as a student at Lincoln's Inn. At Eton he edited the school magazine, The Microcosm, and at Oxford he took the leading part in the formation of a debating society. He made many friends, and his reputation was already so high that Richard Brinsley Sheridan referred to him in the House of Commons as a rising hope of the Whigs. According to Lord Holland, he had been noted at Oxford as a furious Jacobin and hater of the aristocracy. In 1792 he came to London to read for the bar. He had taken his B.A. in 1791 and proceeded M.A. on the 6th of July 1794. Soon after coming to London he became acquainted with Pitt in some uncertain way. The hatred of the aristocracy, for which Lord Holland says he was noted at Oxford, would naturally deter an ambitious young man with his way to make in the world, and with no fixed principles, from attaching his fortune to the Whigs. Canning had the glaring examples of Edmund Burke and Sheridan himself to show him that the great "revolution families" -- Cavendishes, Russells, Bentincks -- who controlled the Whig party, would never allow any man, however able, who did not belong to their connection, to rise to the first rank. He therefore took his place among the followers of Pitt. It is, however, only fair to note that he always regarded Pitt with strong personal affection, and that he may very naturally have been influenced, as multitudes of other Englishmen were, by the rapid development of the French Revolution from a reforming to an aggressive and conquering force. In a letter to his friend Lord Boringdon (John Parker, afterwards Earl of Morley), dated the 13th of December 1792, he explicitly states that this was the case. Enlightened self-interest was doubtless combined with honest conviction in ranking him among the followers of Pitt. By the help of the prime minister he entered parliament for the borough of Newtown in the Isle of Wight in July 1793. His maiden speech, on the subvention to the king of Sardinia, was made on the 31st of January 1794. It is by some said to have been a failure, but he satisfied himself, and he soon established his place as the most brilliant speaker on the ministerial side. It may be most conveniently noted here, that his political patrons exerted themselves to provide for his private as well as his official prosperity. Their favor helped him to make a lucrative marriage with Miss Joan Scott, who had a fortune of £100,000, on the 8th of July 1800. The marriage was a very happy one, though the bulk of the fortune was worn away in the expenses of public and social life. Mrs. Canning, who survived her husband for ten years, was created a viscountess in 1828. Four children were born of the marriage -- a son who died in his father's lifetime, and was lamented by him in very touching verse; another a captain in the navy, drowned at Madeira in 1827; a third son, Charles, afterwards created Earl Canning; and a daughter Harriet, who married the Marquess of Clanricarde in 1825. The public life of Canning may be divided into four stages. From 1793 to 1801 he was the devoted follower of Pitt, was in minor though important office, and was the wittiest of the defenders of the ministry in parliament and in the press. From 1801 to 1809 he was partly in opposition, partly in office, fighting for the foremost place. Between 1809 and 1822 there was a period of comparative eclipse, during which he was indeed at times in office, but in lesser places than he would have been prepared to accept between 1804 and 1809, and was regarded with general distrust. From 1822 until his death in 1827 he was the most powerful influence in English, and one of the most powerful in European, politics. In the spring of 1796 he was appointed under-secretary for the foreign office, and in the election of that year he was returned for Wendover. He was also appointed receiver-general of the alienation office, a sinecure post which brought him £700 a year. His position as under-secretary brought him into close relations with Pitt and the foreign secretary, Lord Grenville. During the negotiations for peace at Lille (1797), Canning was actively concerned in the devices which were employed by Pitt and Grenville to keep the real character of the discussion secret from other members of the cabinet. Canning had a taste for mystery and disguises, which he had shown at Oxford, and which did much to gain him his unfortunate reputation for trickery. From the 20th of November 1797, until the 9th of July 1798, he was one of the most active, and was certainly the most witty of the contributors to the Anti-Jacobin, a weekly paper started to ridicule the frothy philanthropic and eleutheromaniac rant of the French republicans, and to denounce their brutal rapacity and cruelty. But Canning's position as under-secretary was not wholly pleasant to him. He disliked his immediate chief Grenville, one of the Whigs who joined Pitt, and a man of thoroughly Whiggish aristocratic insolence. In 1799 he left the foreign office and was named one of the twelve commissioners for India, and in 1800 joint paymaster of the forces, a post which he held until the retirement of Pitt in 1801. During these years of subordinate activity Canning had established his position as an orator and a wit. His oratory cannot be estimated with absolute confidence. Speeches were then badly reported. The text of his own, published by Therry (6 volumes, London, 1828), were revised by himself, and not for the better. Though his favorite author was John Dryden, whose prose is uniformly manly and simple, and though he had a keen eye for faults of taste in the style of others, Canning had himself a leaning to preciosity and tinsel. His wit was, and remains, above all question. In public life it did him some harm in the opinion of serious people, who could not believe that so jocose a politician had solid capacity. It exasperated opponents, some of whom, notably Peter Pindar, retaliated by brutal personalities. Canning was constantly reminded that his mother was a strolling actress, and was accused of foisting his pauper family on the public funds. The accusation was perfectly untrue, but this style of political controversy was common, and was adopted by Canning. He put himself on a level with Peter Pindar when he assailed Pitt's successor Addington on the ground that he was the son of a doctor. While out of office with Pitt, Canning proved a somewhat insubordinate follower. The snobbery and malignity of his attacks on Addington roused considerable feeling against him, and his attempts to act as a political go-between in ministerial arrangements were unfortunate. On the formation of Pitt's second ministry he took the post of treasurer of the navy on the 12th of May 1804. In office he continued to be insubordinate, and committed mistakes which got him into bad odor as untrustworthy. He endeavoured to persuade Lord Hawkesbury to join in a scheme for turning an old friend out of the India Office. 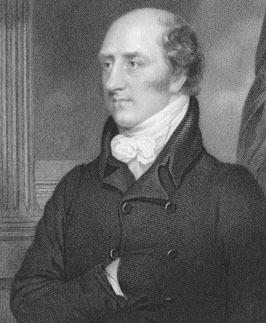 Though his relations with Pitt began to be somewhat strained towards the end, he left office on the minister's death on the 21st of January 1806. Canning, who delivered the eulogy of Pitt in the House of Commons on the 3rd of February, refused to take office in Fox's ministry of "all the talents." Attempts were made to secure him, and he was offered the leadership of the House of Commons, under the supervision of Fox, an absurd proposal which he had the good sense to decline. After the death of Fox, and the dismissal by the king of Lord Grenville's ministry, he joined the administration of the Duke of Portland as secretary of state for foreign affairs. He held the office from the 25th of March 1807 until the 9th of September 1809. During these two years he had a large share in the vigorous policy which defeated the secret articles of the treaty of Tilsit by the seizure of the Danish fleet. As foreign secretary it fell to him to defend the ministry when it was attacked in parliament. He refused to tell how he became aware of the secret articles, and the mystery has never been fully solved. He threw himself eagerly into the prosecution of the war in Spain, yet his tenure of office ended in resignation in circumstances which left him under deep discredit. He became entangled in what can only be called two intrigues. In view of the failing health of the Duke of Portland he told his colleague, Spencer Perceval, chancellor of the exchequer, that a new prime minister must be found, that he must be in the House of Commons, that the choice lay between them, adding that he might not be prepared to serve as subordinate. In April of 1809 he had told the Duke of Portland that Lord Castlereagh, secretary for the colonies and war, was in his opinion unfit for his post, and must be removed to another office. The duke, a sickly and vacillating man, said nothing to Castlereagh, and took no steps, and Canning did not enlighten his colleague. When he found that no measures were being taken to make a change of office, Canning resigned on the 7th of September. Castlereagh then learned the truth, and after resigning sent Canning a challenge on the 19th of September. In the duel on Putney Heath which followed Canning was wounded in the thigh. His apologists have endeavored to defend him against the charge of double dealing, but there can be no question that Castlereagh had just ground to be angry. Public opinion was strong against Canning, and in the House of Commons he was looked upon with distrust. For twelve years he remained out of office or in inferior places. His ability made it impossible that he should be obscure. In 1810 he was a member of the Bullion Committee, and his speeches on the report showed his mastery of the subject. It was no doubt his reputation for economic knowledge which chiefly recommended him to the electors of Liverpool in 1812. He had been elected for Tralee in 1803, for Newtown (Hants) in 1806 and for Harwich in 1807. But in parliament he had lost all influence, and is described as wandering about neglected and avoided. In 1812 he committed the serious mistake of accepting a well-paid ornamental mission to Lisbon, which he was about to visit for the health of his eldest son. He remained abroad for eighteen months. In 1816 he submitted to enter office as president of the Board of Control in Lord Liverpool's cabinet, in which Castlereagh, to whom he had now become reconciled, was secretary of state for foreign affairs. In 1820 he resigned his post in order to avoid taking any part in the proceedings against Queen Caroline, the wife of King George IV. Canning's return to great office and influence dates from the suicide of Castlereagh in 1822. He had accepted the governor-generalship of India, which would have implied his retirement from public life at home, and refused to remain unless he was promised "the whole inheritance" of Castlereagh -- the foreign office and the leadership of the House of Commons. His terms were accepted, and he took office in September 1822. He held the office from that date until April 1827, when he became prime minister in succession to Lord Liverpool, whose health had broken down. Even before this he was the real director of the policy of the cabinet -- as Castlereagh had been from 1812 to 1822. It may be noted that he resigned his seat for Liverpool in 1823, and was elected for Harwich, which he left for Newport in 1826. Few English public men have represented so many constituencies. His fame as a statesman is based mainly on the foreign policy which he pursued in those years -- the policy of non-intervention, and of the patronage, if not the actual support, of national and liberal movements in Europe. To this policy he may be said to have given his name, and he has enjoyed the reputation of having introduced a generous spirit into British politics, and of having undone the work of his predecessor at the foreign office, who was constantly abused as the friend of despotism and of despots. It may well be believed that Canning followed his natural inclinations, and it can be asserted without the possibility of contradiction, if also without possibility of proof, that he had influenced the mind of Castlereagh. Yet the fact remains that when Canning came into office in September 1822, he found the instructions to be given to the representative of the British government at the congress of Verona already drawn up by his predecessor, who had meant to attend the congress himself. These instructions were handed on without change by Canning to the Duke of Wellington, who went as representative, and they contain all the principles which have been said to have been peculiarly Canning's. Indeed this policy was dictated by the character and position of the British government, and had been followed in the main since the conference of Aix-la-Chapelle in 1818. Canning was its orator and minister rather than its originator. Yet his eloquence has associated with his name the responsibility for British policy at the time. No speech of his is perhaps more famous than that in which he claimed the initiative in recognizing the independence of the revolted Spanish colonies in South America in 1823 -- "I resolved that, if France had Spain, it should not be Spain with the Indies. I called the New World into existence to redress the balance of the Old" (December 12, 1826). When Lord Liverpool was struck down in a fit on the 17th of February 1827, Canning was marked out by position as his only possible successor. He was not indeed accepted by all the party which had followed Liverpool. The Duke of Wellington, Sir Robert Peel and several other members of the ministry, moved perhaps by personal animosity, and certainly by dislike of his known and consistent advocacy of the claims of the Roman Catholics, refused to serve with him. Canning succeeded in constructing a ministry in April -- but the hopes and the fears of friends and enemies proved to be equally unfounded. His health had already begun to give way, and broke down altogether under the strain of the effort required to form his ministry. He had caught cold in January at the funeral of the Duke of York, and never recovered. He died on the 8th of August 1827, at Chiswick, in the house of the Duke of Devonshire, where Fox had died, and in the same room.